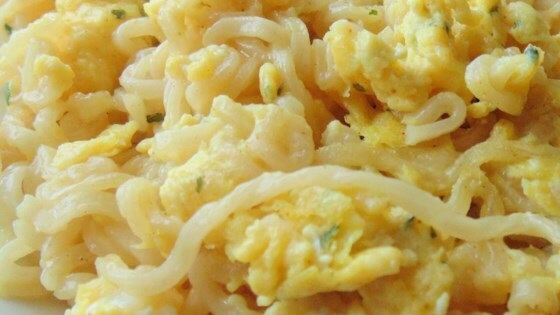 "This recipe is great for a quick and easy breakfast! Add hot sauce at the end, if desired!" Bring a pot of water to a boil; add ramen noodles and cook for 3 minutes. Drain water and stir seasoning packet and parsley into noodles. Heat oil a non-stick skillet over medium heat; cook and stir onion until fragrant, about 2 minutes. Add noodles and stir for 2 minutes more. Whisk eggs, water, and salt together in a bowl; pour into same skillet as noodle mixture. Cook and stir eggs until set and cooked through, 2 to 4 minutes. I really loved it. I omitted the extra salt as so many people have mentioned and add some parmesan cheese. This is going to be my new easy-peasy-lazy dinner. Made this for the first time for the family. Nice addition to the breakfast repertoire. Next time around might reduce amount of seasoning and add some sweet peppers. Delicious and couldn’t be more easy to prepare. I added some diced tomatoes with the onion and a splash of hot sauce. Yums:)!